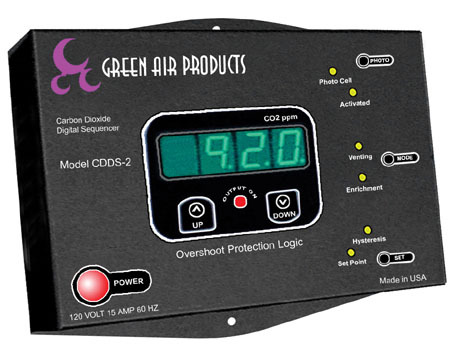 The Green Air Products Carbon Dioxide Digital Sequencer (CDDS-2) transforms the CO2 monitor into a powerful and versatile controller. The CDDS-2 provides a easy to use set point controller which enables the user to adjust CO2 level and span. CO2 values are adjustable in 10 ppm increments from 0 to 5000 ppm. The span between CO2 "On" and CO2 "Off" (hysteresis) is also adjustable in 10 ppm steps up to 300 ppm differential. The LED changes color to indicate CO2 function status. The CDDS-2 also provides a switchable photo sensor to disable CO2 production during darkness periods.